At the first (hopefully annual) Portland Mini-Maker Faire, we brought out Captain Chronomek, Steampunk props, and our jewelry made from electronic components. We also ran a very popular jewelry-making workshop. We’re still recovering from an awesome weekend at Maker Faire in San Mateo. It was an amazing experience-packed with people, blasted by intermittent high winds, and capped off with a solar eclipse. Josh ran 4 hour-long workshops on Steampunk prop making, and they all went really well. We’re gearing up for Maker Faire, only a week away (and functionally less than that, since we leave town at the start of the week). Josh has been scouring eBay for excellent treasures to be used in his workshop on Steampunk prop making. Highlights include a collection of vintage gauges & readouts, and a box full of optics and lenses. And we constructed a confessional-style video booth for Vintage Tomorrows. Sunday it all goes into the pickup truck to begin the journey to San Mateo! Tanenbaum Fabrications is going to Maker Faire! Posted on May 3, 2012 by Karen Tanenbaum | Comments Off on Tanenbaum Fabrications is going to Maker Faire! We’re gearing up for our first trip to the almighty Maker Faire Bay Area in a couple weeks. We will be there as part of a group of Steampunk makers & academics, under the banner of the “Steampunk Academy“. Captain Chronomek will make at least one appearance, and we’ll be holding hands-on workshops for making Steampunk props out of recycled materials. Comments Off on Tanenbaum Fabrications is going to Maker Faire! Captain Chronomek will be visiting Emerge 2012! Posted on February 18, 2012 by Josh Tanenbaum | Comments Off on Captain Chronomek will be visiting Emerge 2012! We are excited to announce that Captain Chronomek will be featured in a new exhibition on Design Fictions that is taking place at the “Emerge: Artists + Scientists Redesign the Future” conference at Arizona State University. Captain Chronomek is one of four featured design fictions alongside such superstars as Boilerplate, Henry Hoke and the Instititute of Backyard Studies, and Adiel Fernandez (aka Adiel Angel). We will all be part of an exhibition sponsored by Intel entitled “Powered by Fiction: Artists, Makers, Tinkerers and the Backstories that Inspire Them to Create”. “What it means to be human is changing. Emerging technologies are transforming our minds, our relationships, everything we own and the very landscapes in which we live. What kinds of humans will we become? What kinds of humans should we become? These singular questions will be explored on March 1–3, 2012, when Arizona State University hosts Emerge–an unparalleled campus–wide event uniting artists, engineers, bio scientists, social scientists, story–tellers and designers to build, draw, write and rethink the future of the human species and the environments that we share. And then we’ll celebrate. Arizona State University, the nations’s largest university, is determined to break down the barriers between those making the future and those thinking about what it all means. 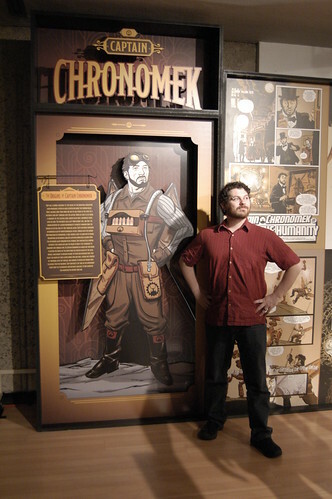 Comments Off on Captain Chronomek will be visiting Emerge 2012! Posted on February 18, 2012 by Josh Tanenbaum | Comments Off on Welcome to Tanenbaum Fabrications! Welcome to the new site for Tanenbaum Fabrications. Comments Off on Welcome to Tanenbaum Fabrications!